There is a lot of celebrating going on around us at this time of year, but what if you aren’t part of that? 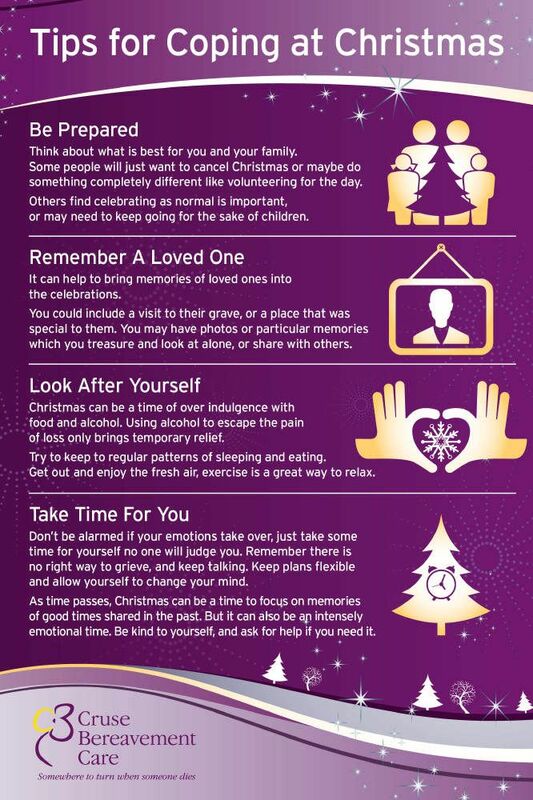 There are many reasons that you may be finding the festivities hard to cope with. One of those is bereavement, either a recent one or one that happened at this time of year in the past. Cruse have put together the graphic at the bottom of the page which you may find useful. But there are other reasons; you may be suffering from an illness that makes it hard to feel like celebrating. This could be a mental health illness or one that gives you physical pain. You might be estranged from family members and all the talk of family gatherings make it hard for you to join in the happiness because of your own emotions. Your children may not be spending Christmas with you as they are with their other parent or your family is in another country. You may be lonely and feel you don’t have anyone to spend the holiday with. There are always organisations open to offer you crisis help if you need it, the most well know is the Samaritans who are there to talk if you need it. Maybe what you need is to plan to change something longer term and are thinking about therapy. This might be the time to initiate that, please feel free to contact me if that is the case. To all those people who are finding it tough this year I hope you find some solace and find some peace despite what is going on for you.